I’ve been a fan of the smoky eye since basically forever, it’s always been one of my go-to looks. Instead of a smoked-out black eye, I like to change it up with different colors and one of my all-time favorites is a brown smoky eye. It’s a lot softer, a little more romantic than it’s darker counterpart and perfect for work, dates, weekend, whenever! Step 1: Apply brown eyeliner to eye lid and smear. I love using eyeliner, especially the kajal liners from Physicians Formula, as a base for my smoky eyes because it helps to add depth and keeps the look lasting longer. Line along bottom lashline. Step 2: Apply the matte chocolate brown shade (M6) in the Full Exposure Travel Palette on the eyelid blending up into the into crease. 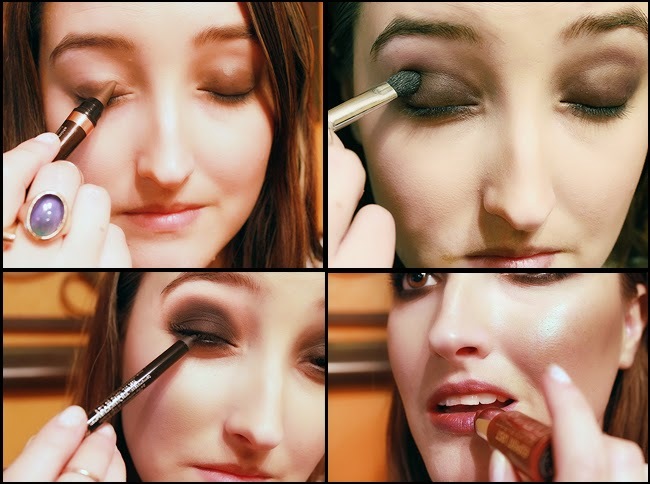 Using a smaller brush, line the lower lashline with the same dark brown. Next, using a blending brush, apply the beige matte shade (M3) into the crease bringing up towards the brow bone. Finally, apply the lightest shade (M4) to brow bone and inner corners of eyes to help open the eyes. Step 3: Using Rimmel Scandaleyes Eyeliner, line your upper lash line– it’s totally fine if its not perfect. Line your lower lash line as well as your waterlines. To soften and create the smoky effect, use a q-tip or a liner brush and blend over the liner. To keep the look super soft, use a darker brown eye liner in place of the black liner. Step 4: Curl lashes and apply two coats of mascara. Step 5: Finish the look with a soft, pretty plum shade such as NYC Expert Last Lip Color in Sugar Plum. Selfie time! I hope you liked this quick tutorial, sorry for the bad lighting photos, next one will be better, promise! *I received the NYC Expert Last Lip Color and Rimmel Scandaleyes Eyeliner from Influenster, however I would not use any product I do not approve of. All opinions expressed are my own.